Today we are posting an email marketing best practices infographic. After all these years, email marketing has become more mature, but some basics still apply. Also, every year, new people join the growing email marketing family and need to get up to date with email marketing best practices. For some, the best practices concerning subject lines, content, visuals and calls-to-action are all too familiar. They have tried and tested many things troughout the years and have found out what works and what not. However, every company and every list of contacts is different. What works with one group of contacts might not work with the other. By taking the points in the email marketing best practices infographic below into account however, you can give yourself a headstart if you’re just starting out in email marketing. And even if you’ve already been active in email marketing for a few years or are a veteran: these points are a nice reminder and compilation of what to keep in mind when sending out email marketing campaigns. 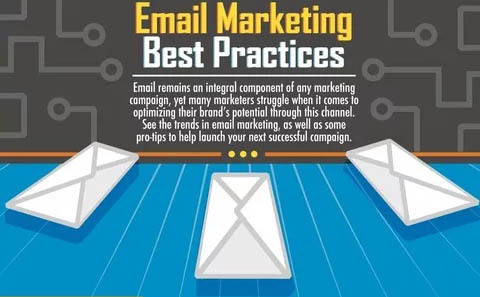 Here’s the email marketing best practices infographic, courtesy of Prestige Marketing. If you like marketing infographics, be sure to check out the other ones posted here on Emailmarketingweb.com.